Staybridge Suites Guelph features an indoor pool, a 24-hour fitness centre and outdoor barbecue grills The spacious accommodations are furnished with full kitchens. A daily breakfast and WiFi is both free. All the studio and apartments offer a seating area and a 32-inch LCD TV with satellite, cable and pay-per-view channels. A hairdryer is included in the bathroom. Some have a hot tub. 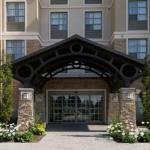 Guests at the Staybridge Suites Guelph can enjoy an all day convenience store and grocery shopping services. The nearest restaurant is within 1 km from the property. The University of Guelph is 6.8 km away, while Lester B Pearson Toronto Airport is at a distance of 40 km..
We plan to add more related stuff like: pet friendly hotels in Guelph, Ontario dog friendly hotels in Guelph, dog parks in Guelph, pet stores in Guelph, ON, and pet spas in Guelph. Keep checking for more!